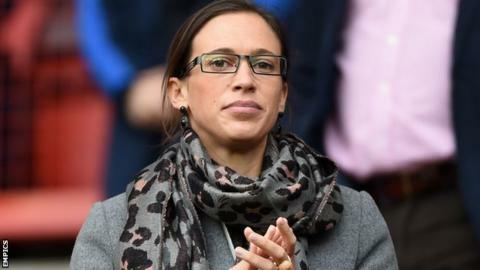 Charlton have launched an investigation after the resignation of their chief executive Katrien Meire was falsely posted on Companies House. Fans have aimed protests at Meire, 31, about how the club is run. "This document is false," said a statement on the Charlton website. "The club is investigating the matter as it is something we take seriously." Companies House said the documentation had been received "in good faith" and "satisfied the required checks". The document, accessible on the Companies House website, claims Meire's position was terminated on 5 December. However, Belgian Meire, who joined Charlton's board of directors in January 2014, remains the chief executive at The Valley and the signature on the form appears to be a forgery. It incorporates and dissolves limited companies, registers the information companies are legally required to supply and makes that information available to the public. There are more than 3m limited companies registered in the UK - and 500,000 new companies are incorporated each year. Under the Companies Act 2006, an individual found guilty of filing false documents to Companies House could receive a prison term of up to two years, a fine, or both. In a statement, Companies House said Charlton had not signed up to a scheme which "would prevent false or fraudulent submissions being made". A section of Charlton supporters are calling on owner Roland Duchatelet to sell the club, having questioned his motives since he took over the Championship side in January 2014. The club, managed by Belgian Jose Riga, is currently bottom of the table, four points from safety with 16 matches remaining. Some fans formed a group called Coalition Against Roland Duchatelet (CARD), which has organised a series of protests at matches at The Valley, primarily aimed at Duchatelet and Meire. However, 69-year-old Belgian businessman Duchatelet, who has a network of clubs in Europe, insists the Addicks are not for sale. In a message on Twitter, CARD insisted it was not responsible for the false form being posted on the Companies House website.